New Trend – Go BIG! I want to officially take credit for any future trend that starts in the near future where the designers go BIG instead of mini. At least, in my mind, I’ll take the credit. 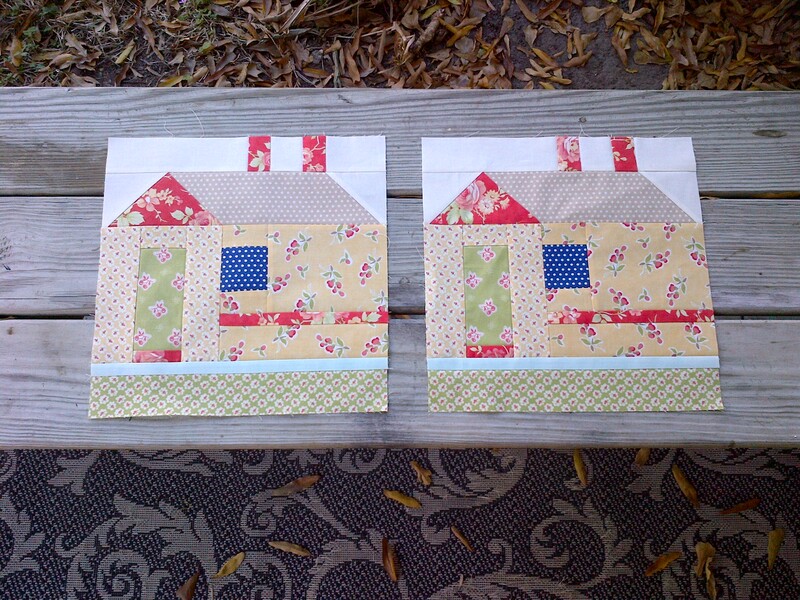 I am asking Linh to mimic the paisely motif designs in the quilting when I send it to her. It feels so great to already know how I want it quilted too. Now, my decision is to order more of this same fabric to complete the entire backing (I need a few inches on either side and about 12″ on top and bottom), or use a similar print, but in High Street HOT PINK to finish it up (which I already have in my stash). 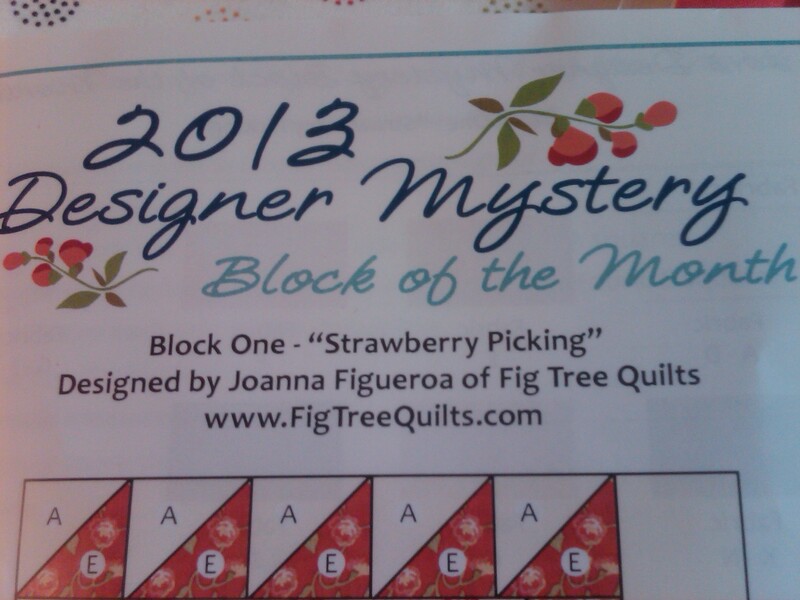 I think I know what I want, but I’ll do my final reveal when it is quilted. Also, I had some good luck with eBay auctions in the past week as well. Lots of ‘vintage’ bundles from one seller, who apparently is a Fat Quarter Shop fan as well. 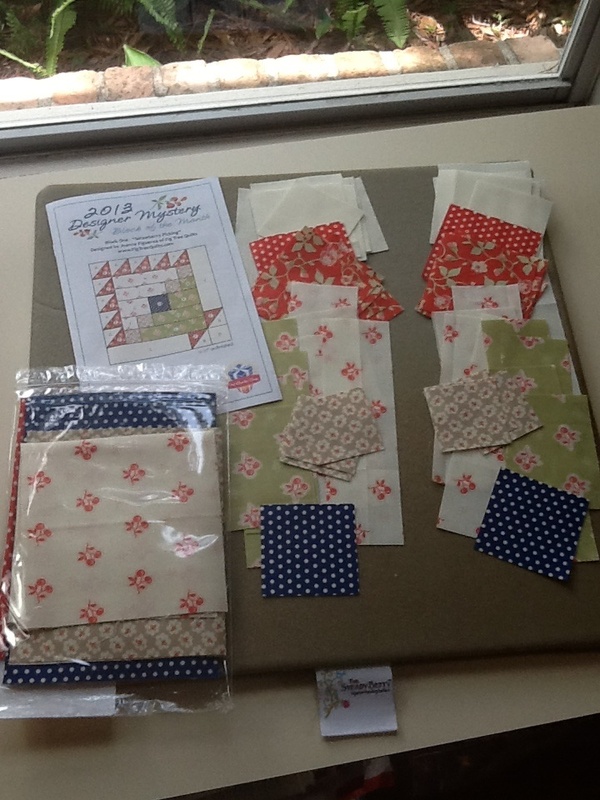 I am gathering different collections from American Jane fabrics. I was able to get a charm pack of Cherries Jubilee and a fat quarter pack of Building Blocks (from 2007). I also bid on this adorable sewing tin and won it for only $15! I don’t think the other bidders read closely in the description or looked at all the pictures, because it was full of so many goodies! Love the decorative pins – can add those to my collection as well. 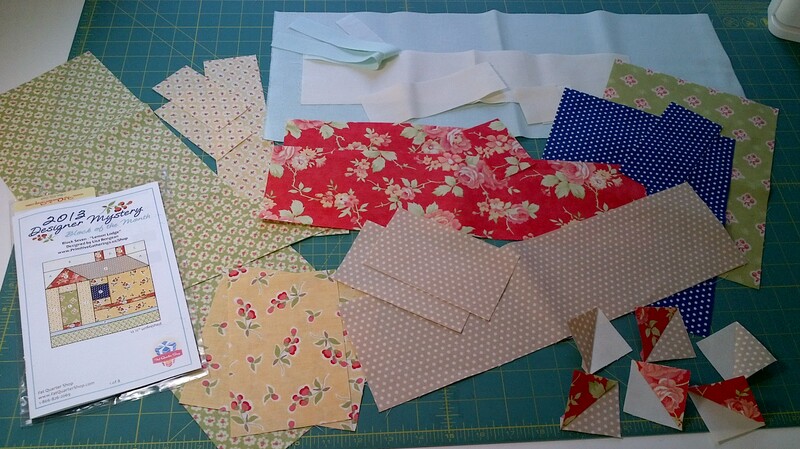 Another ‘vintage’ charm pack of Notting Hill , labels, buttons, needles, scissors, magnets, thread, ribbons, and some hexagon paper piecing templates. I was thrilled to win it. 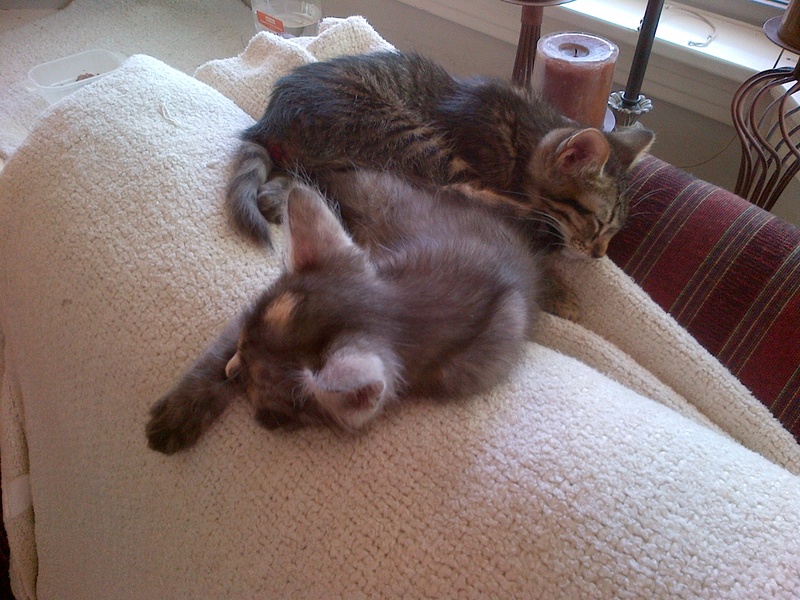 And, today wouldn’t be complete without sharing some kitten pictures with you. I hope you have a great week ahead! FQS DM BOM Block 7 Done! 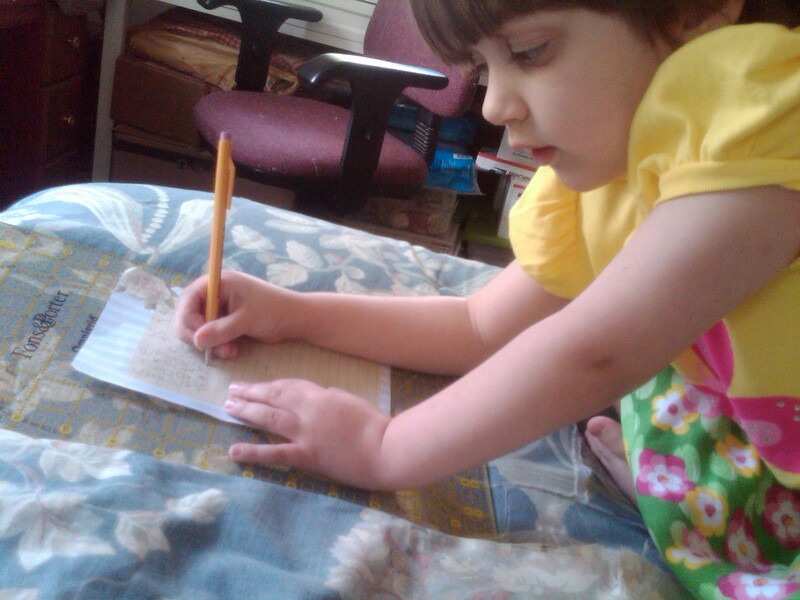 I have actually gotten through several tasks this weekend, enough to fill two posts – but I’m breaking it up into two. I didn’t even have to think twice before I grabbed my parts according to the pattern and ran them through the machine. And for some reason, they cling a little to the fabric due to static electricity I think, so they don’t slide off as easily as I thought they would. The tiles are printed the same on both sides also. After a short amount of time – I had Block 7 done! This was probably the highest residual month so far. 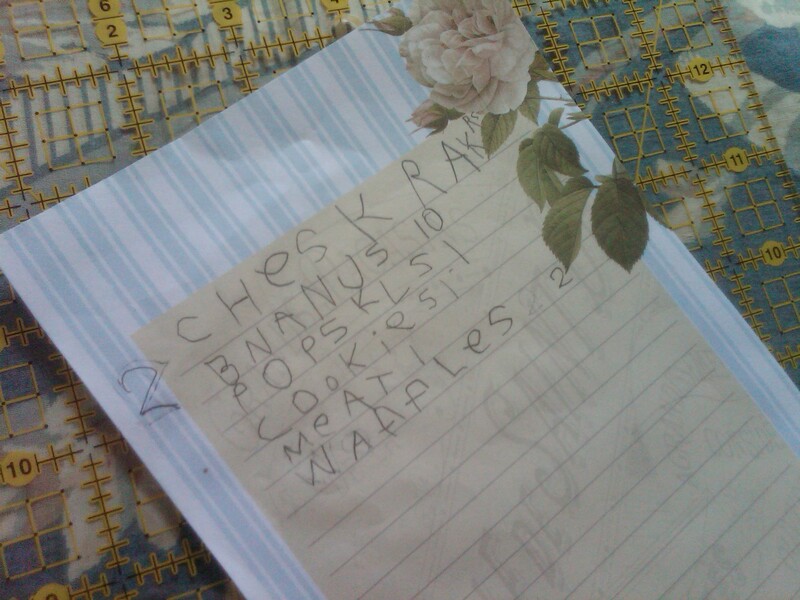 Look at all of these leftovers for my stash, even after making TWO blocks! 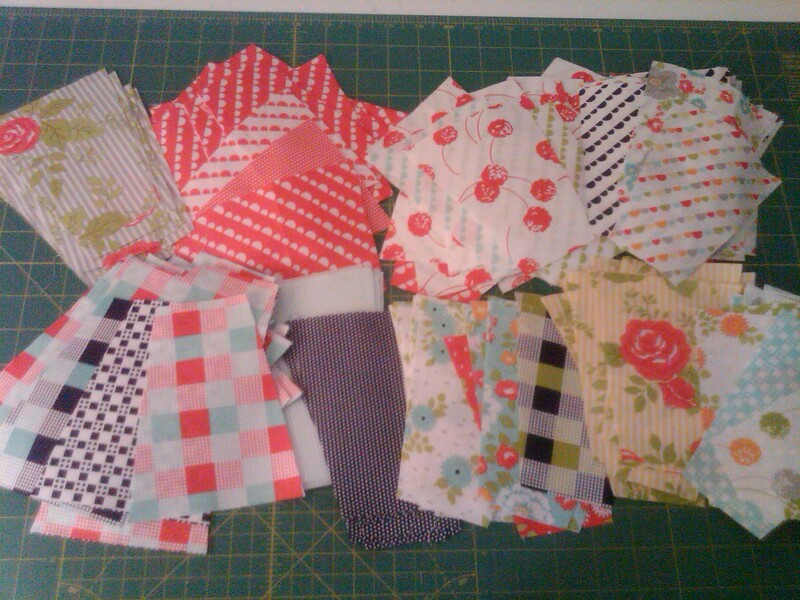 Yes, I made a few HSTs from the trimmings, but I’ll just hang on to them and see how I can use them later. They are 2″ unfinished. LOVE these bright colors … BUT … because I LOVE variety also – here is my change of pace project that I also started this weekend. 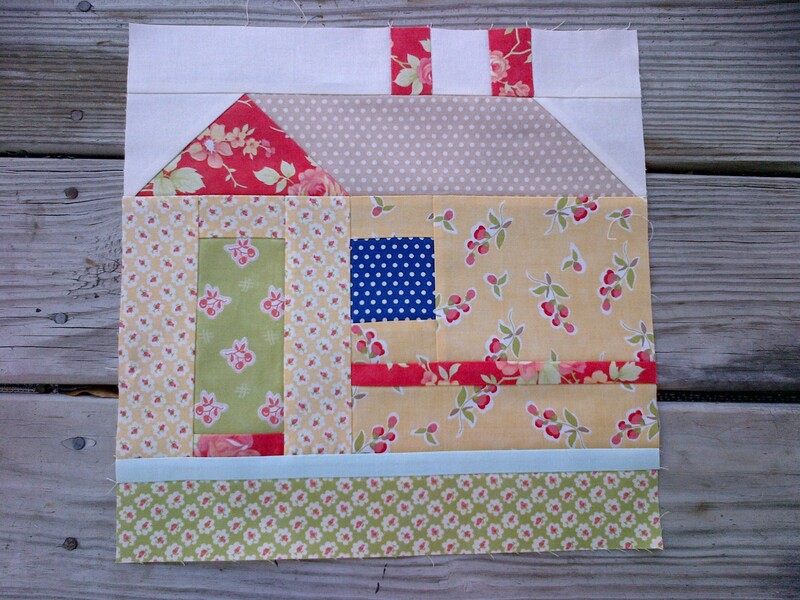 Remember back late last year, I blogged here about a new magazine quilt pattern called REACH FOR THE STARS? 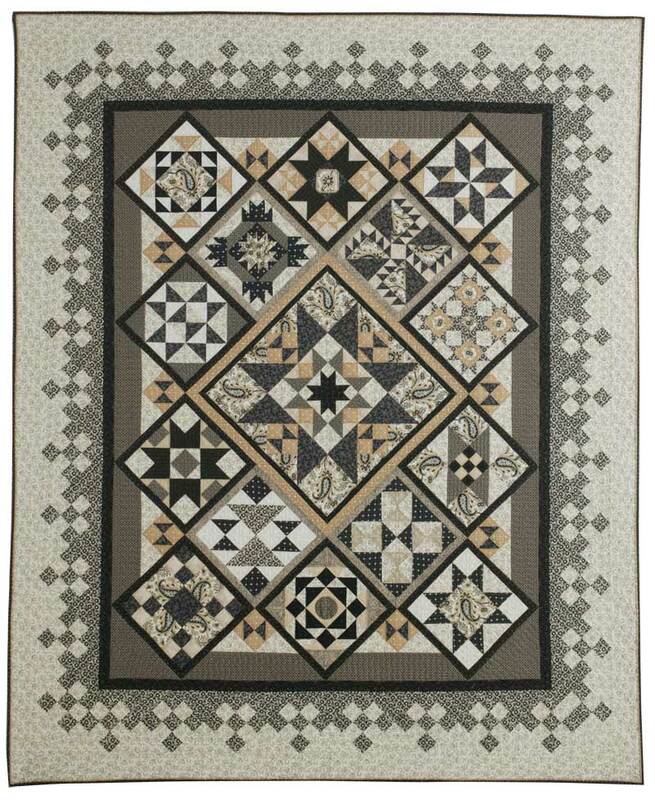 It is being published in the Quilters Newsletter magazine over 7 volumes. 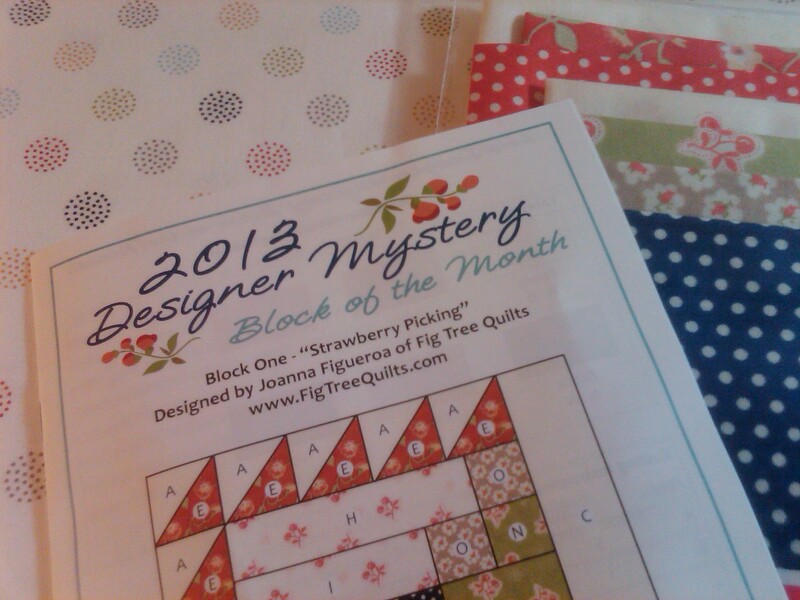 I have the first two magazines so far, and I have the center block almost completed (pattern in first month). 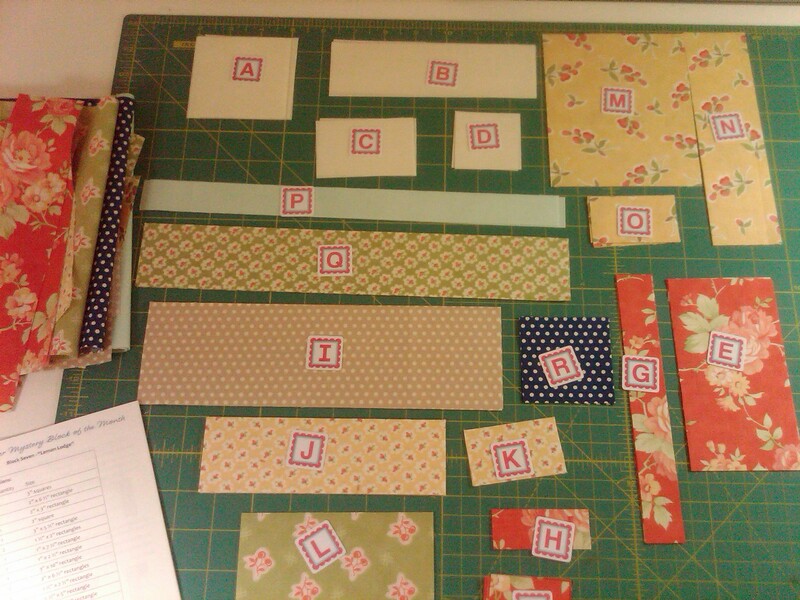 I fell in love with the neutral color scheme and fussy cutting and wanted to try and match it as closely as possible. I started with American Gothic from Pam Buda and never stopped! I had added bits and pieces here and there from other collections and designers – but this is just a teaser for my next post! 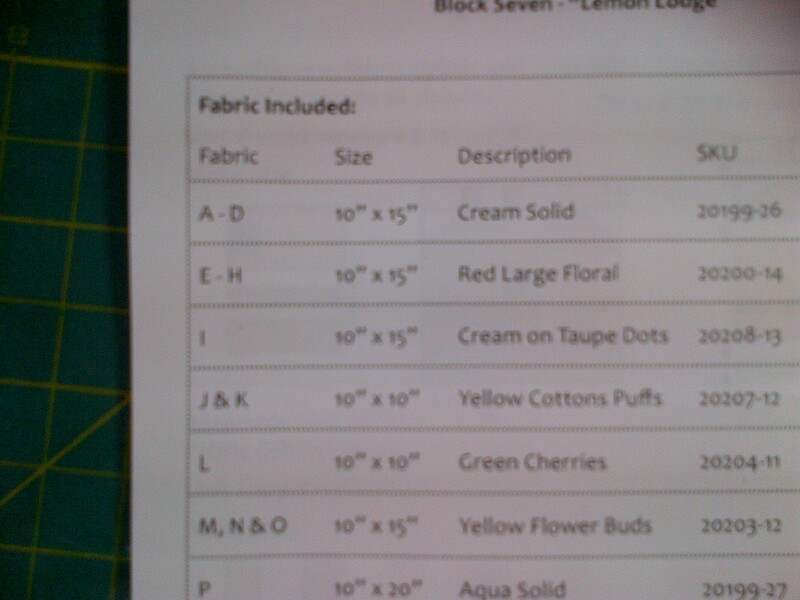 I’ll show you my fabric selections and the center block next time! I hope you will come back and see! Perhaps sew along? There are at least two other ladies that I know of that have started on this quilt also. Until then – thanks for visiting and have a great remainder of the weekend! For the first time, I asked to demo a new sewing machine. My LQS, It’s A Stitch, is a dealer of Bernina machines. I have been sewing on a basic Singer model for about 20 years. I have only had it serviced once for cleaning, and that was about 3 years ago. No problems. And nothing fancy. Oh… no …. I need this new machine and I must find a way to afford it. The Bernina 750 QE with optional Embroidery Module. 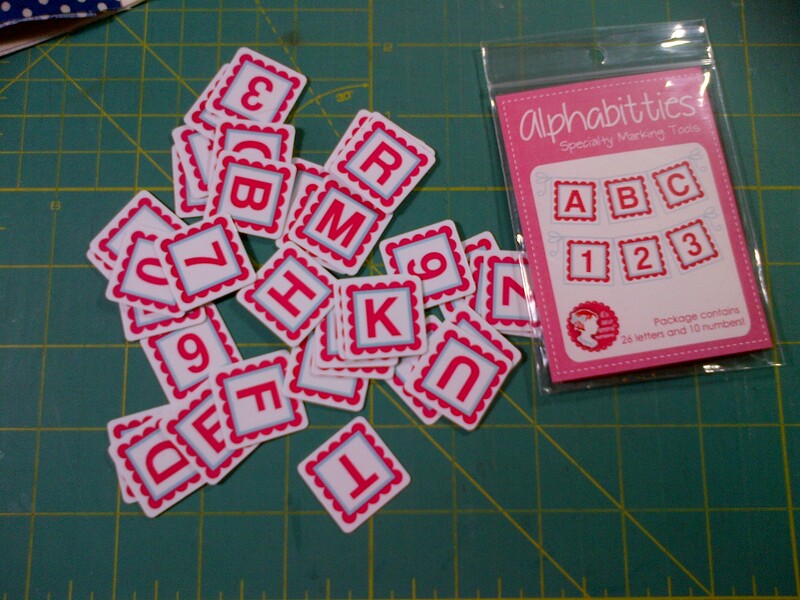 I don’t even have to buy the embroidery module to start with, but I can add it on at any time later. That is the long extension piece to the left side. It’s almost an 11″ throat too! I’ve been searching the internet for reviews on this machine and they all seem positive. Now, it’s time to start my savings account 🙂 The shop has a special that you can trade in a non-Bernina machine and get 10% off … but I think I am too sentimentally attached to my Singer to do that. I would be greatly interested if anyone who reads my blog has experience with this series of machines. For those of you in the USA, or just a fan of ours, have a great 4th of July holiday tomorrow! This is a fairly forgiving pattern. It’s amazing how hard it is for me to sew all these straight lines and have it all come out square. 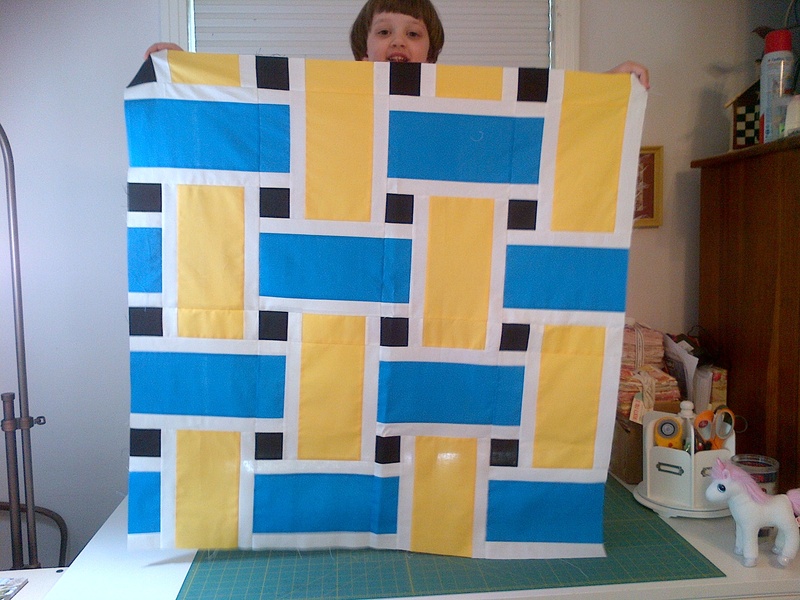 My husband said this looks more like a lawn chair than a quilt. I prefer maroon, white and grey – but these are UCLA colors and should be perfect. 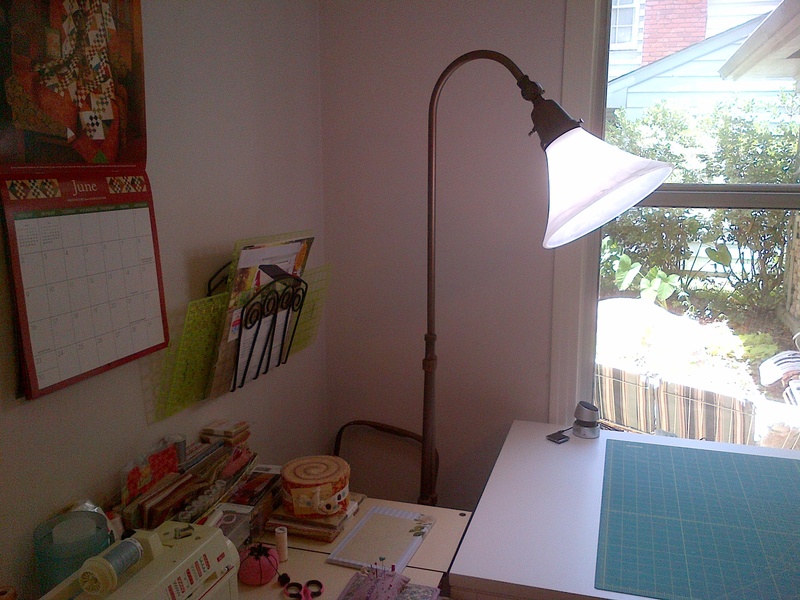 Notice how neat and tidy the sewing table is? 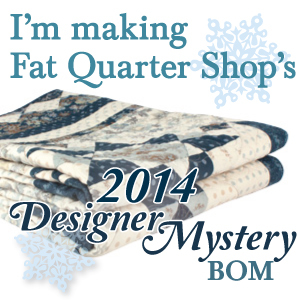 I finally sent off not one, not TWO, but THREE quilt tops to LiMa Sews. 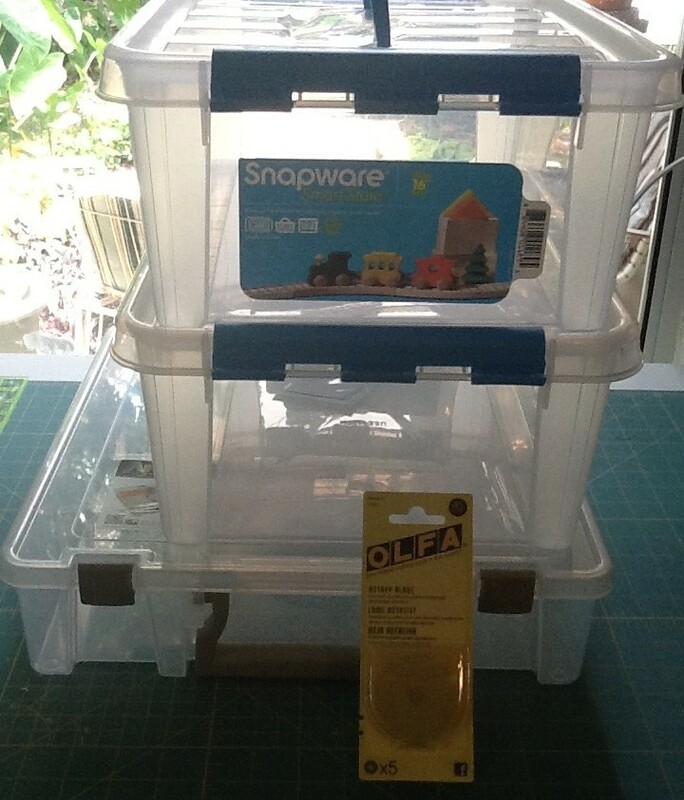 Then I took my newly purchased project boxes and got a little more organized. 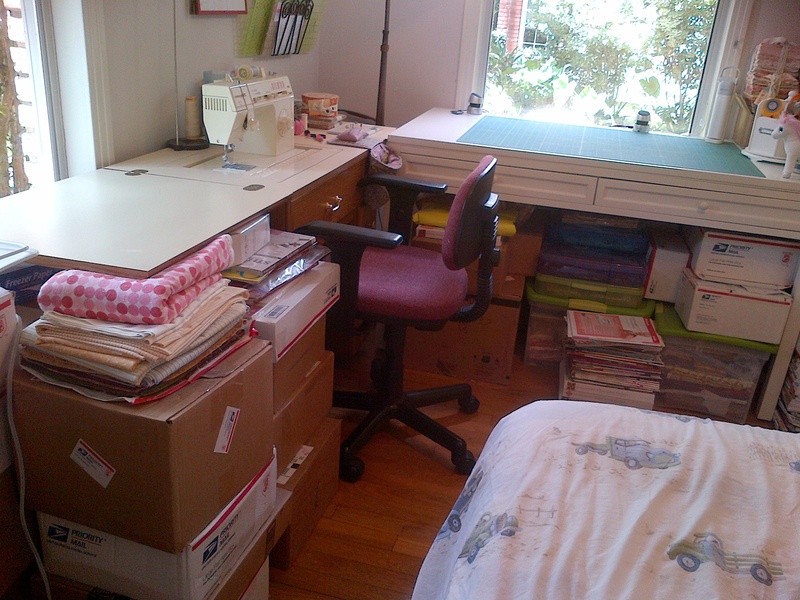 Here is a picture of my sewing corner from a distance. This is as clean as it gets. My stash boxes are part of the permanent fixtures in my room. Along with my stacks of magazines, books and patterns. Another great buy I made on Friday from Joann Fabrics is my new Ott Lite lamp. First, they had them more than half off (half off is fairly common for them, if you wait awhile). Then, since I went shopping last weekend, I got a special coupon for 25% my total purchase – including sale items (which is more rare). Therefore, I got a $275 lamp for $75. It was too good a deal to pass up. Especially since I do so much of my sewing really late at night. You can also see on my wall, a mounted magazine rack which I bought specifically for my long rulers. It works out great! 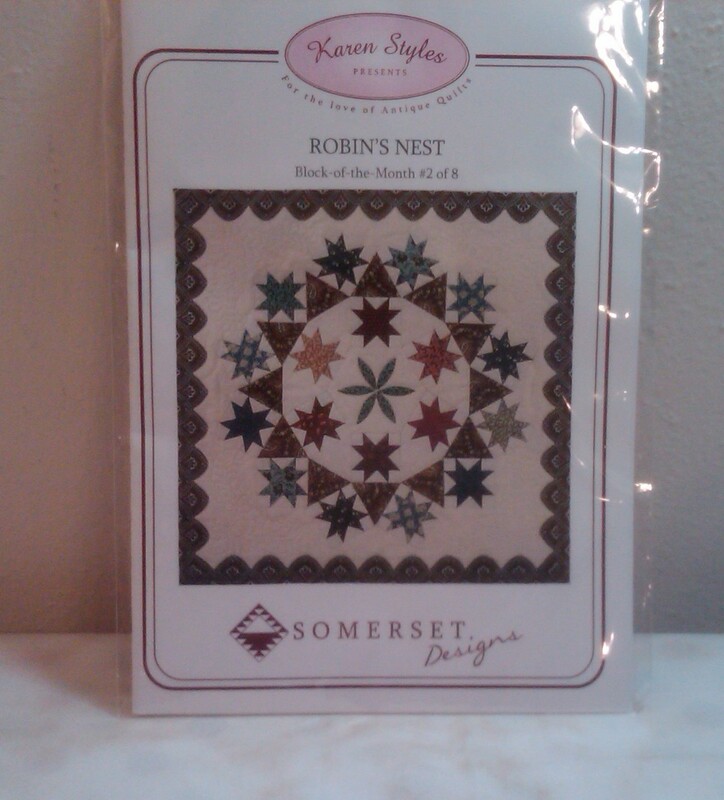 I also worked on my Robin’s Nest applique, but I’m only halfway through the block. I’ll show it off when I’ve got it completely attached. I’m not sure how well I’m doing on it. It looks a little …. messy? 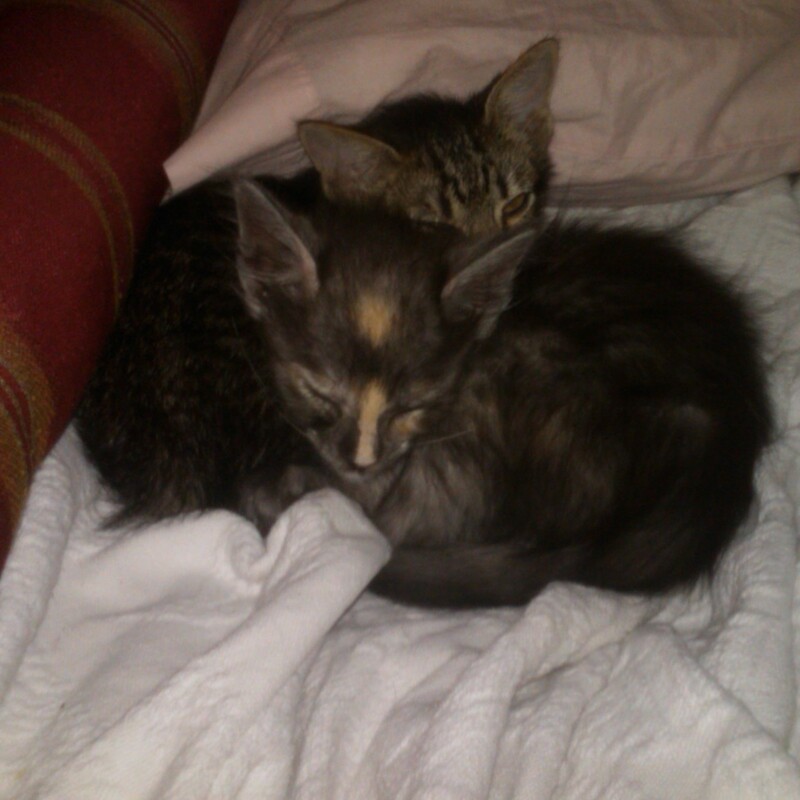 Finally – a gratuitous picture of the kittens. Hope you had a great weekend!